Learning English has never been easier than today. With the advancement of technology, with just one click, learning is possible. One of the most common problem students are facing after studying English in Cebu is the moment they go back to their home land, they would lose all their chances to speak and practice what they had learned. So the learning would eventually become sedentary and inactive. As a result, frustrations starts to sink in again. One remedy for this problem is to study online, with or without teacher. Classes in Skype are what is being used to connect the teacher and the student. In Cebu, there are several online schools that offers various type of classes depending on the length. One of the school that offers quality online classes is First Wellness English Academy (FWEA) among others. For FWEA school, it serves as a continuiung program for those students who has already left the school here in Cebu and still wants to continue the lesson with their teachers. So, learning is not ceased. Another possible alternative to prevent sedentary learning is to study on your own. There are many sites available that is designed for self-study. This websites are created in such a way teachers are not needed in the learning process but rather students are taught to learn on their own with the help of the materials prepared online. Although technology would no way substitute a real human teacher, but taking into consideration time, money and effort, self-study is the only feasible choice. 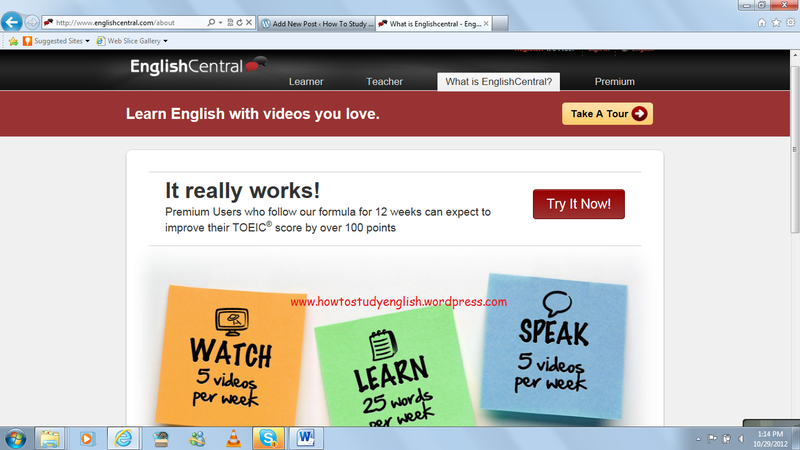 One site the I recommend to enhance vocabulary and listening skills is www.englishcentral.com. This site is carefully structured to suit the needs of the students in all different levels. Videos come with subtitles for easier shadowing and reference. It can be repeated as many times as possible which I believe is the very very helpful. In addition to that, the topics of the videos are so varied from entertainment to technology to business to politics. There is one for you! The videos are not boring and most of them are very informative when it comes to technical knowledge. I believe this site would really be helpful to those who wants to maintain their own English proficiency. The site offers free trial classes but they do charge if you want longer subscription. Tip of advice, use technology to improve your English. There is always a way.